It’s not everyday that it snows in Greater Victoria but when it does, there are crews around the region at the ready. 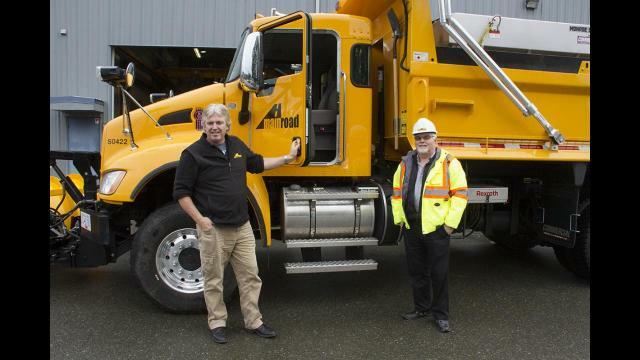 Mainroad South Island Contracting LP has been gearing up for winter since September, preparing for what they’re predicting will be a season similar to last year. “We’re ready for whatever winter has to throw at us,” said operations manager Leon Bohmer. Just entering the 14th year of a 15-year contract with the Ministry of Transportation and Infrastructure, Mainroad is responsible for the province’s highways and roadways on south Vancouver Island from the Saanich Peninsula to Chemainus, including the West Shore, Port Renfrew, Sooke, Lake Cowichan and six Southern Gulf Islands. Mainroad is not responsible for strata roads or other roadways within municipal boundaries. But the company doesn’t just focus on keeping the roads clear. They’re also working to educate the public about winter driving. With the province’s Shift into Winter campaign starting to gain some traction locally, Gill noted they’re really trying to educate the public about tire requirements and other safety measures that should be utilized during the winter months. “We’re really encouraging that … you could see more enforcement this year,” he hinted. When the region does get snow, Mainroad crews are distributed to routes based on a priority system that sees major highways cleared first, followed by collector and bus routes. “Once we get on top of those we can get into the subdivisions,” Gill explained. Crews carefully monitor roadways, including a number of problem areas that are known to have their own micro-climate or can been treacherous. Three of those areas are the Malahat, the four-lane stretch of Highway 14 in Langford, and the section of Highway 17 between Island View Road and Tanner Road in Central Saanich. The trucks are equipped with sensors that alert drivers to what the air and roadway temperatures are. Employees are also given hand-held devices so they can make informed decisions on how to treat the roads. During an average winter Mainroad utilizes about 40 pieces of equipment with roughly 80 employees distributing more than 4,000 tonnes of de-icing salt, 8,000 tonnes of sand and two million litres of anti-icing brine. “The ice is actually worse … I’d almost prefer to be in a snow zone,” Gill said. With that in mind, brine is their biggest tool in the kit. “We kind of see it as a security blanket … We can get three to five days out of a single brine application,” Bohmer said, clarifying that is dependent on the weather and if it rains the brine won’t last. But he did note that if it’s clear brine can last up to a week. It also provides a barrier under the snow. Unlike salt, which can be redistributed off roadways by other vehicles, brine can be applied when it’s dry and will still stick to the roadway so if there is any precipitation or moisture in the air, it prevents that from freezing. If you see an issue on a south Island highway, you can report it by calling 1-877-391-7310.